Tacos PM is another one of about a gazillion taco places in Merida that serves mostly Mexico City street food; the almighty taco is king. What makes this place stand out from the rest is that as soon as you sit down at one of their locations (the latest one the Critic tried was in Pensiones, near the Plaza de las Americas) is that plate of watery refried beans and warm (yes warm!) tostadas or corn chips to the uninitiated. The fact that they warm them says they care enough to make sure the chips aren’t soggy when they get to you. Merida is a very humid place which makes anything crisp turn soft once the package has been opened and far fancier places like the horrendous and pricey Fogoncito chain can’t get this into their thick skulls. There is nothing worse than biting down on a corn chip, expecting a crunch and getting instead a soft chew. Ugh. And those refried beans spread on that plate are seasoned (or maybe it’s because the Critic is always hungry when he sits down for a snack at PM) in such a way that you cannot stop eating them! And you can ask for another plate if you finish yours too quickly. From the menu there is a huge platter that the Critic and Co tried last night; way too much food for 8 people (two were ordered). Everything but the kitchen sink is on this platter, all chopped and ready to be stuffed into either corn (handmade!!) or flour tortillas. Guaranteed good food, they make an effort with the service, and reasonable prices. The Critic has realized that there are pitifully few reviews these days; this is due in large part to the economic crisis affecting Mexico and the rest of the world. 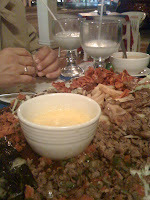 Absent are the reviews on Merida’s fancier restaurants and in their place reviews on smaller, cheaper places. Perhaps this is appealing to a segment of the Critic’s readership so he will not feel bad about it. If anyone would like a review of a particular restaurant and would like to donate funds in order to see that review come to pass, feel free to send an email and the Critic will happily send a PayPal request to you. This review is about Colonos’ restaurant, located on one side of the Parque Alemán, that large colonia established in the late 50’s or early 60’s (what does the Critic know of these things) and that provides a glimpse into what Merida could have been, had the folks charged with increasing the number of developments in Merida followed the fine example of the Colonia Aleman. Wide, treed streets with actual room for parking AND driving, a huge attractive community park and a vibrant market area make this one of Meridas’ favorite traditionally middle class areas to live. Compare this area to the more recent and horrendously overpopulated Francisco de Montejo rabbit hutch development. As the chavos would say ‘nada que ver‘. By the way, the Colonia Alemán is not full of Germans, as it’s name might imply at first glance. Instead, it’s named after Miguel Alemán, a former president who ruled Mexico from 1946 to 1952. But this is about Colonos’ restaurant. Colonos’ is a Yucatecan restaurant/bar that has been there since the dinosaurs were wiped out by the comet crashing in Chicxulub. In fact, the Colonia Alemán was built around Colonos. The specialty at Colonos is the Yucatecan food, served individually, ie. per taco at $10 pesos a taco, or órden (order) for such items as Longaniza or Queso Relleno the Critic’s gastronomic Achilles Heel (he knows it will kill him, but insists on ordering it every time he can since it is SO good). Washed down with a Sol michelada, this expansionist hearty lunch for two was filling to the point of rupture and came to a whopping 330 pesos including a $50 peso tip. Do the math; it’s about 20 dollars US at today’s rates. You can eat less or more of course, but what an excellent way to get a good variety of authentic Yucatecan dishes for so little in a traditional Yucatecan restaurant. you won’t see many tourists here at all! And for the observant, it is true that the Critic was unable to order the Queso Relleno this time since there was simply no room! NOTE: If you make it there earlier, you will get ‘botana‘ (tiny plates with different Yucatecan snacks ranging from the simple – pickled cucumber slices – to the wonderfully elaborate – sik’il pak: a dip made of roasted tomatoes, ground pumpkin seeds, cilantro and minced onion) with every round of drinks or beer you order. No arrests yesterday in Washington D.C., with almost 2 million people struggling to be a part of Obama’s inauguration, so that says a lot about the atmosphere and goodwill present! The official – and probably completely unread – NotTheNews position is one of relief that the Medieval era of Cheney/Bush is finally over. Time to reel in the world’s number one “rogue” nation. All the best to the new president; there’s a LOT of work to be done, both at home and abroad. I am glad to not be the only person to be more than a little worried about Israel’s heavy handed, politically-motivated response to the cowardly Hamas idiots who insist on firing missiles at Israel and then hiding among women and children. They (Hamas) must be so proud of themselves now. That said, it is a sad day for humanity when the elephant, finally tiring of the needle pricks constantly being inflicted on it’s backside by a a few rogue elements in the cage they have built for their neighbors, decide to run amok and destroy the entire contents of that cage. Imagine all the inhabitants, scurrying from one place to another within in that cage, with no place to hide, being systematically trampled by the enraged and completely deranged elephant. 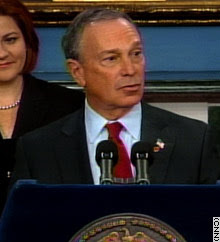 New York City mayor (and aspiring presidential candidate, according to some rumors out there) Michael Bloomberg, in a statement that can only be described as sucking up to his considerable Jewish constituency, maintains that the Israeli offensive is justifiable (I would suggest understandable but not justifiable) and the international law that prohibits this kind of blanket violence, citing the vast disproportionality, is irrelevant, once again showing how obtuse some Americans are, thinking that they are somehow above any silly international law. His analogy, delivered in a CNN interview after a visit to Israel, which he may have though of himself, goes like this (and I quote): “if you’re in your apartment and some emotionally disturbed person is banging on the door screaming ‘I’m gonna come through this door and kill you” do you want us to respond with one police officer which is proportional or with all the resources at our command?” If you can hear this, note how condescending the tone of his voice becomes as he says this, as if he is talking to some 4 years olds who up until that moment, could not possibly fathom the depth of his understanding of the problem. Well Mr. Bloomberg, it’s a good analogy but a stupid conclusion. In a situation like that, I would hope you would send in as many police officers as you thought necessary to apprehend and detain this emotionally disturbed person, not sent in a a unit of the 21st Airborne to bomb the entire building and kill the emotionally disturbed person’s entire family, as well as a few neighbors and probably destroy the building, thereby also weakening the structure in which your apartment resides as well. Maybe Mr. Bloomberg should concentrate on New York City’s more pressing problems as a city and not go around offering such idiotic opinions on international events. I apologize to those looking for light-hearted comments on the sanitary installations of the local bus terminal here in Merida; I promise there will be more of that soon! I just couldn’t resist commenting when I heard this on the news. And be forewarned: there will be some upcoming criticism of Mr. Obama’s cabinet selections as well, so you might want to avoid coming around in the next few weeks. The automobile financing through HSBC was a bust. After several more phone calls back and forth with my crest-fallen ejecutivo, who would have loved to have made his December quota of loans, and was prepared to go as far as to remove my mothers maiden name from the six-year-old bank records in order to have the loan application be approved, it became apparent that the loan was not to be. At one point he even admitted to me that upon filing the paperwork, he ‘discovered’ that I had been registered as a ‘Mexican’ and that is why I had been assigned the second last name, just like any normal Mexican national would have. I found this just a little hard to believe and asked him why then did they have a Canadian passport on file as the principal form of identification for this Mexican and was this common, for Mexicans to use foreign passports to identify themselves. He insisted that I was indeed a Mexican in their ‘sistema‘ at which point I mentally closed the HSBC credit application door and decided that either they were completely incompetent or mildly retarded (no offense to anyone suffering from mild retardation). At the same time, when I sensed that the credit application at HSBC was not going anywhere, I had gone ahead and processed the same information through Scotiabank. (In the interest of fairness, I did inform the HSBC executive of this move) Interestingly, although I was a complete stranger to them, they did NOT require a co-signer for the loan application. Apparently, they did approve the loan, but again, the stumbling block was my mothers’ maiden name; and some sort of ID was needed that had that name on it. The salesman at the car lot insisted that it could be anything, even the most absurd little piece of identification since he ‘knew’ the manager of the bank branch in question and that she knew me and that it would be enough to see the maiden name on something. Nothing came of this loan application either, but it is notable to compare the attitude and flexibility of Scotiabank, where I have never had an account, to that shown by the trogloditos at the ‘world’s local bank’ where I have banked for six years. And what about the car, you ask? Well it turns out that a neighbor was selling one of his cars and lo and behold, the price was right and the amount he was asking fit right into the amount left in my pocket after paying off some debts after the sale of the yellow car! HSBC Merida – Possibly the World’s Worst Bank? HSBC – the worlds’ worst bank? Maybe not. But they are definitely in the running. Besides implementing such shoddy hiring practices that have resulted in the lower primates appearing at the front lines of the banking industry in Merida, they have provided me with this latest gem in banking logic that defines Mexico for me (the admittedly neurotic foreigner) in all its Kafka-esque wonder. HSBC: the world’s local bank. Indeed. Hongkong and Shanghai Banking Corporation has taken the term ‘local’ to a level perhaps previously unheard of in the banking industry. They are also aggressive in the car financing area, actually offering a lower rate of interest than their main competitor, Scotiabank. Where they get you though, is in the insurance. They insure through ING and over the period of a longer term, the difference in the insurance will make a big difference in the amount of money paid on the loan. I decided on HSBC, figuring it would be quicker, since they already had all my info on file, such as income and ID information which would make the application a breeze, while at Scotiabank I was a complete stranger. It did however strike me as strange and rather onerous that they would ask me for photocopies of my passport, FM3, proof of domicilio (photocopy of my telephone bill). Didn’t they already have all this on file? Well, perhaps they need this because I am a foreigner and something might have changed, although a quick glance at the activity in my bank account would ascertain, that no, there was plenty of movimiento, money coming and and going out daily, as in any business. In addition to the above, it turned out that my bank needed a co-signer/guarantor, because I was, after all a foreigner. Make a note of that. At this point of the application, I AM A FOREIGNER. So, along with everything else, a photocopy of my wife’s ID and a completed application signed by her as co-signer of the loan. I have the bank account, the debit card and a credit card issued by this very same bank, that I have had the misfortune to max out this past September October November thank you very much and only pay the interest on. But, I need a car and don’t have that last chunk of cash. So I am thinking: whatever. My income information, I was assured, would be pulled from ‘el sistema‘ so it wasn’t necessary to provide photocopies of three months of banks statements. Well thank goodness for that. As my new friend Lynne would say, with just a touch of sarcasm ‘happy dance’. Not. Later on in the day, after not receiving the promised phone call, I managed to contact the ‘ejecutivo‘ who informed me that ‘chispas‘ (literal translation: sparks, but actually a euphemism for ‘chinga‘ which is much worse and considered a ‘bad’ word) there is a problem. The problem is that the ejecutivo needs an ID with my second last name on it. So my bank, the bank I have been dealing with for the last SIX years, has me on file with both my last names. At some point, upon opening the account, they asked me what was my mothers maiden name and I told them. At no point did I show them an ID with my mothers maiden name on it because such an ID DOESN’T EXIST. When I applied for a credit card, they issued me one, with the offending second last name ON THE CARD. When I applied for an increase in the limit on said credit card, it was approved, OFFENDING SECOND LAST NAME AND ALL. Now, it appears that they need some sort of ID to validate this strange last name that has somehow come to their attention. After SIX years. This is the bank I have been dealing with for the last six years. They have my personal and business accounts. My business is registered with the Mexican version of the IRS, called the SHCP, under my name which is my FULL name and that includes my mothers maiden name. So when the fine HSBC ejecutivo offered to ‘remove’ the offending last name I kindly reminded him that such an action would cause some serious problems with the federal tax authorities, he had to concede that yes, that would be a problem and repeated, in a hopeful but sad little voice ‘chispas‘ couldn’t I find an ID that had my mothers’ maiden name on it? ……………………… to be continued ……………………..